Home > Shop By Brand > GYEON Car Care > GYEON Q2M Compound 1000 ml. High cutting abilities with low dusting! GYEON Q2M Compound is a heavy cutting product that delivers extreme correcting ability with low level dusting and an incomparable finish. Designed to remove medium to heavy swirls, scratches, and other paint imperfections, GYEON Q2M Compound fully corrects your paint and preps it for a follow-up polish for unparalleled results. To get that perfect paint before coating, correct it with GYEON Q2M Compound! GYEON Compound delivers extreme correcting ability with an incomparable finish. The secret to a high shine is perfect paint. And we don’t mean just a weekly wash here. We’re talking about the removal of swirls, scratches, and other paint imperfections so gloss and shine you’re trying to achieve isn’t muted and dulled. Many times, the only way to perfect your paint is with a compound and polish – if there’s no abrasive technology being used, there’s no way it will correct the paint! Free of all synthetic properties, silicones, and fillers, GYEON Q2M Compound actually removes the imperfections rather than just masking them. The water-based formula uses high-quality Japanese abrasive technology that allow for excellent results in just 1 to 2 tries! GYEON Q2M Compounds high cutting power comes with an impressively low level dust, yet a high-quality finish. 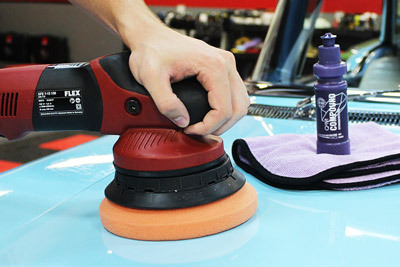 This makes subsequent steps much quicker and easier and reduces your over-all detailing time. With a maximum cut rating of 6 out of 6 and a finish rating of 4 GYEON Q2M Compound gets you one step further to perfect paint. QYEON Q2M Compound can be used with both a Rotary or Dual-Action Polisher and cutting pads to remove paint defects from swirls to light oxidation. GYEON Q2 Pure 30 ml.GYEON Q2 Pure 50 ml.GYEON Q2 One 30 ml.GYEON Q2 One 50 ml.GYEON Q2 SyncroGYEON Q2 Mohs Ceramic Paint Coating - 30 mlGYEON Q2 Mohs Ceramic Paint Coating - 50 mlGYEON Q2 Matte 50 mlGYEON Booster - 30 mlGYEON Q2 CanCoat - 200 mlGYEON Q2 Trim - 30 mlGYEON Q2 Rim - 30 mlGYEON Q2 View - 20 mlGYEON Q2M Compound+GYEON Q2M Compound+ 1000 ml.GYEON Q2M Compound 120 ml. GYEON Q2M Polish 120 ml.GYEON Q2M Polish 1000 ml.GYEON Q2 Primer 120 ml.GYEON Q2 Primer 1000 ml.